April 11 is the forty-fifth anniversary of the Apollo 13 mission to the moon. Apollo 13 was the mission that never landed on the lunar surface, but it became a legendary story of a true test of courage and ingenuity from the US space program. I had the recent good fortune to visit family living in Colorado. As I was preparing to leave at the Denver Airport, I encountered a statute that in many ways has completed a circle I started with Apollo 13 some forty-plus years ago. The statue is of Apollo 13 astronaut Jack Swigert. The bronze cast shows Swigert in his astronaut suit. The plaque refers to Swigert as “Astronaut and Congressman Elect.” He was about to begin his first elected term in the US House of Representatives when he died from cancer in the early 1980s. I asked a fellow Californian who was viewing the statue with me to take this picture. In my youth, I followed the space program with great interest. As a young boy, I was in front of the television set many times for rocket launches. My family circled around the set in July of 1969 when Apollo 11 landed on the moon. I was a hardened space fan, but even I was becoming disinterested in moon landings after the second one (Apollo 12). I recall seeing Apollo 13 lift off on April 11, 1970, but my life was beginning to be occupied with all the things teenagers encounter. My interest level changed two days later when we learned there was a problem aboard Apollo 13. News reporters on television tried to explain something about an explosion aboard the spacecraft, and how the astronauts were moved to the lunar module as plans were made to bring them back to Earth. I recall feeling concerned, but confident that the crew would make it home safely. The now familiar story ends with a successful return to Earth for the three astronauts. Commander Jim Lovell wrote a book called Lost Moon about the mission. Fred Haise worked in private industry after retiring from NASA. Jack Swigert lived in Colorado and was elected to the US House of Representatives. He died before taking office in 1982. I never realized just how serious the effort to return the astronauts to Earth was until many years later when I started reporting on the space program as a television reporter for WAAY in Huntsville, Alabama. NASA’s Marshall Space Flight Center was in Huntsville, so anything about the space program was a local news story in northern Alabama. During my short time in Huntsville in the early 1980s, I learned more about how dangerous the Apollo 13 mission was as the ground crew worked the problem to bring the crew home safely. A few years later, the Ron Howard film Apollo 13 introduced a new generation to the story behind the story of that mission. For many years, watching the movie was a family tradition in my house. During the time when I was working as an adjunct college lecturer, I used clips from the movie to demonstrate leadership principles. The movie remains one of my all-time favorites. I met astronauts Jim Lovell and Fred Haise in 1996 when both appeared at a business conference I was attending. I was told at that event that this was the first time the two appeared together in public since the end of the mission. 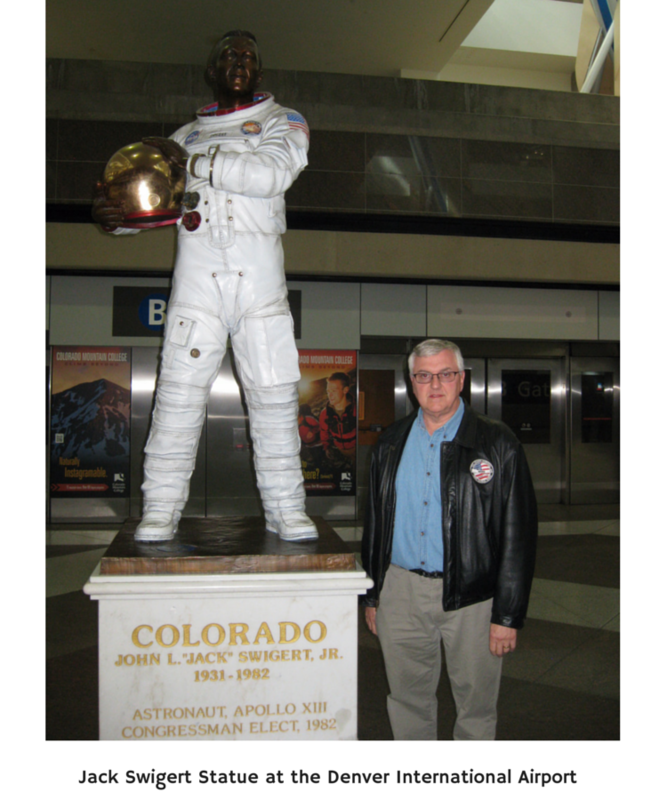 Seeing the statue of Jack Swigert in Denver brought back many of those memories. From childhood passing on through my teen years, I experienced the excitement of the space program transition to a less intense interest as I grew older. I saw that passing interest reinvigorate as a journalist working in a town where space exploration defined the community, I re-lived, if only for a few moments, the thrill of reporting on the first three Space Shuttle missions. As a slightly bit older adult, I reconnected with my passion for the space program thanks to the movie Apollo 13 and the opportunity to meet the two surviving members of the crew. And now a bronze statue of the astronaut who survived that ordeal only to be taken much too early brings it back full circle. Apollo 13 showed us that bravery isn’t just about knowing the risks and acting anyway. The forty-fifth anniversary of that historic mission gives all of us an opportunity to spend a few moments reflecting on the successes we have experienced and the obstacles we have overcome. Apollo 13 has also shown us that leadership comes in all shapes and sizes. From the crew’s courage under fire, to the steady seriousness demonstrated by flight director Gene Kranz , to the short-sleeved NASA technicians who offered solutions that kept the astronauts alive as the spaceship was being brought back home, Apollo 13 has proven the very best we all can do by working together. Steve Newvine lives in Merced. 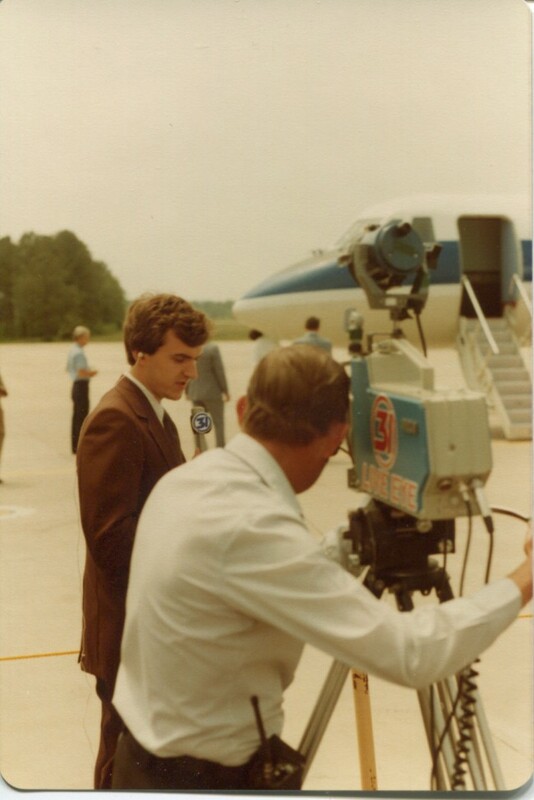 He worked as a Space and Science reporter for WAAY-TV in Huntsville, Alabama from 1980 to 1982.